This is where two main roads in the city cross at an angle rather than at 90 degrees and it illustrates well how a dynamic townscape evolves over what is often centuries through a combination of factors including, of course, topography but also military and strategic history, wider patterns of roads and transport - so where people are travelling to or from either away from the city or within the city - and inevitably ownership and property boundaries and then in many cases the direct involvement of a monarch, a city council and - from the 20th century onwards - planning authorities and transport companies. As with so much of the street plan in Copenhagen, the modern layout of Trianglen goes back to the late medieval defences of the city. Østerport or the east gate of the city has gone but it was just south of what is now Østerport station - the clue is in the name. The important road north from the city to Helsingør skirted round the top end of the lakes, keeping to the higher ground of a dam holding back the water of the lake, and with low-lying and marshy ground between the lake and the coast to the east that was itself also part of the defences to slow down or deter an invading army. This point was still seen to be vulnerable to attack so from the 17th century and through much of the 18th century there was an outer defence and garrison just at the top north corner of the lakes . Just beyond that a road cut away to the west at an angle as the start of the King’s highway crossing the open ground and then continued on to Lyngby and from there to the royal castle of Frederiksborg. Further down the lake was Nørreport - the north gate with its own bridge over the lake and this was another main road in and out of the city. From there a road cut across the open ground at an angle - the line of what is now Nørre Allé - to connect with the highway to and from Lyngby. 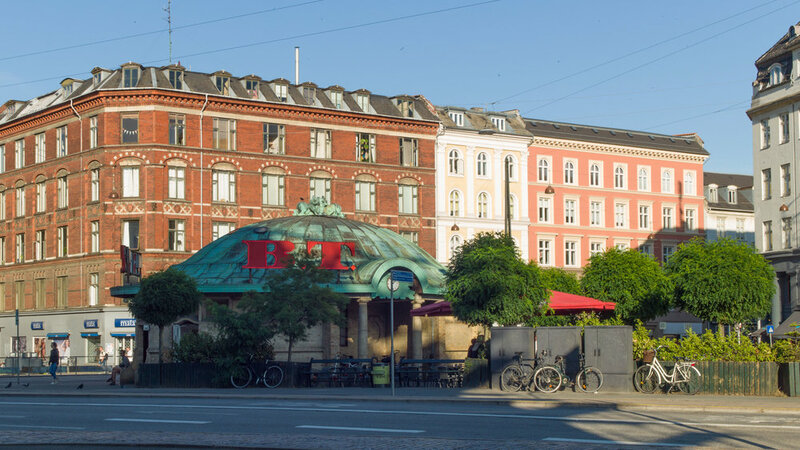 Inevitably, people cut between the two roads - between what are now Østerbrogade and Nørrebrogade - both inside the lake and outside the lake and that outer road is what is now Blegdamsvej. 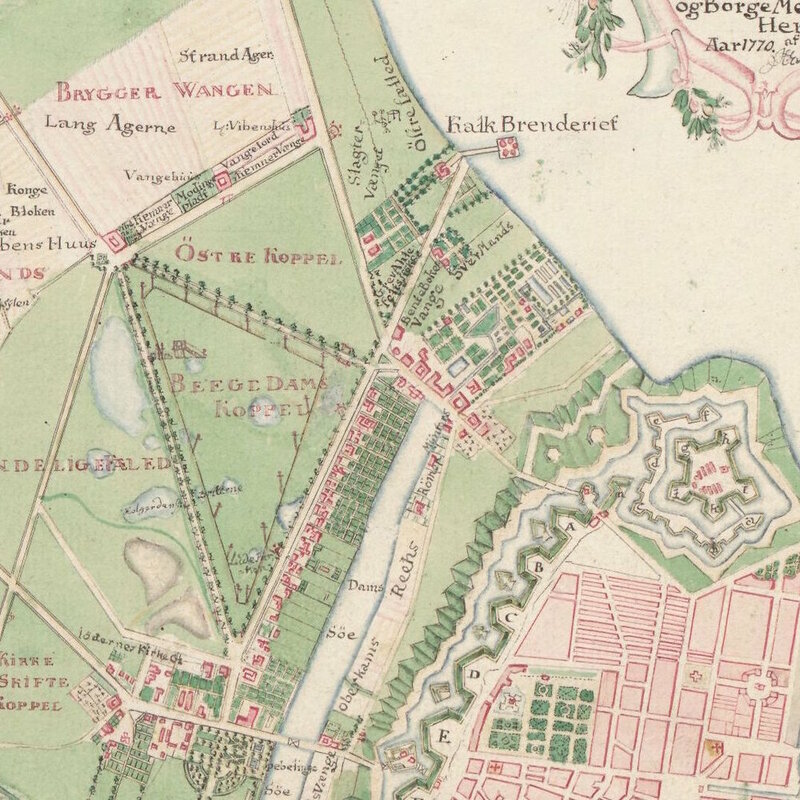 On a map of 1770, you can see that Blegdamsvej met the road out from the East Gate at an angle and then carried straight across to a straight road that ran down to the sea. This was an important and presumably busy road as down on the shore were chalk kilns - marked on the map - and a quay or pier where, presumably, ships offloaded chalk from further down the coast. Through the period of rapid building and rebuilding in the city through the 18th and 19th centuries there must have been an almost insatiable demand for cement and plaster for all the building work in hand. The map also shows that part of the open ground was used as a bleaching ground - a triangular area at the centre is marked as 'Beege Dams Koppel' and shows line of posts that were presumably strung with ropes to form what are called in England 'tenter frames' where linen was left to dry in the sun. Bleg as in the Blegdamsvej means pale. Through the 19th century houses and apartment buildings were constructed along the main roads and then more densely along new streets to the east and this became an important and a heavily populated district of the city by the end of the 19th century with the construction of the Free Port. As the city expanded north so Trianglen became an important interchange on the tram and bus system and, of course, that position as a ‘transport hub’ will be reinforced by the opening of the metro station here in 2019. The road out from Trianglen to Lyngby remained as an avenue with open ground on both sides and in the 19th century the north part of this area was used by the army with a barracks in buildings on the west side of Østerbrogade just north of Trianglen - some of which survive but now used for shops and apartments around Gunnar Nu Hansens Plads and Østerfælled Torv. Parts of the open ground were built over in the late 19th century - particularly with building plots across the south side along Blegdamsvej - but in the early 20th century the area was designated as a public park and as an area for sport for the city - the national football stadium is here - and it is now one of the most popular and most used public parks in the city. The buildings around Trianglen date from around 1900 and are large apartment buildings with shops on the ground floor. The most prominent and, in terms of its architecture, the most important building is the oval-shaped public toilets with waiting rooms and ornate stone benches around the outside that stands on the east end of the central island. It was designed by the architect PV Jensen-Klint and was built in 1907-1908. The curved shape of the copper roof soon earned the building the nickname of The Large Terrine although it is also called Bien or The Bee taking the name from a kiosk here.